The grumpiest fish in children’s literature is back with another case of “the dreary wearies.” This time, Mr. Fish, star of The New York Times bestselling Pout-Pout Fish series, is down in the dumps over holiday shopping. With a message for readers of all ages, The Not Very Merry Pout-Pout Fish (Farrar, Straus, & Giroux Books | Macmillan Children's Publishing Group, Ages 2-6) finds Mr. Fish so consumed with finding that perfect gift for each of his friends that he forgets the true meaning of the holidays. When Mr. Fish—with his signature Pout-Pout Fish frown—comes up empty-handed, Miss Shimmer intervenes with a plan to make homemade gifts. He soon learns that it’s not about busting the budget or gifting the season’s hottest item, but giving from the heart. Together they experience the joy that comes from giving and sharing—the merriest gifts of all. I was introduced to the Pout-Pout Fish book series in August 2014. My nieces were enamored with the book about the fish who was worried about going to school in The Pout-Pout Fish Goes to School. Now they're excited that another Pout-Pout Fish book has become available, and this time it's geared towards the holiday season. 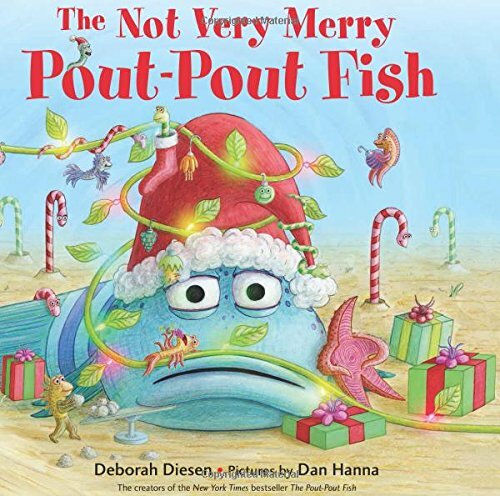 A hardcover book with a story told in rhythmic form, The Not Very Merry Pout-Pout Fish tells of a blue pouty fish who is bent on getting the biggest and best presents for everyone. Pout-Pout Fish keeps running into obstacles, though. For instance, a store becomes closed before the fish can get in to get the presents. Pout-Pout Fish becomes downtrodden and thinks his friends will be upset. Miss Shimmer, another sea creature, comes along and shows Pout-Pout Fish that gifts don't have to be the biggest or most expensive; the best ones are those that come from the heart. This book, with darling illustrations, has an encouraging message that teaches children that Christmas isn't all about the gifts. It's about the love that radiates from the heart and the thoughtful gifts that can't be store-bought. Meet the Pout-Pout Fish author and illustrator during the 12-city book tour, running Nov. 14 through 21. I need this book for my youngest. He's been so pouty lately.